Cannabinoid receptors are present at key sites involved in the relay and modulation of nociceptive responses. The analgesic effects of the cannabinoid CB1 receptor are well described. The widespread distribution of these receptors in the brain does, however, also explain the side-effects associated with CB1 receptor agonists. The cannabinoid CB2 receptor also produces analgesic effects in models of acute, inflammatory and neuropathic pain. The sites and mechanisms of CB2 receptor-mediated analgesia are described herein. 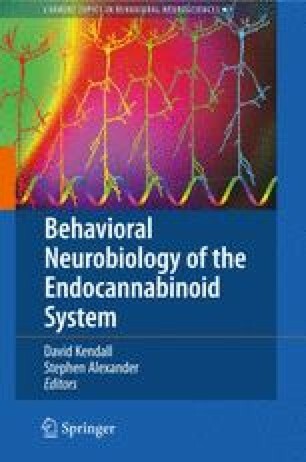 In addition to targeting cannabinoid receptors directly, protection of endocannabinoids (eCBs) from metabolism also produces analgesic effects. Indeed, reports that noxious stimulation elevates levels of eCBs in the spinal cord and brain provide further rationale for this approach. The effects of inhibition of fatty acid amide hydrolase (FAAH) on nociceptive responses in models of inflammatory and neuropathic pain are discussed. We would like to thank the Wellcome Trust, Medical Research Council and GlaxoSmithKline for financial support towards the original research discussed in this review.